Nothing to do this weekend? 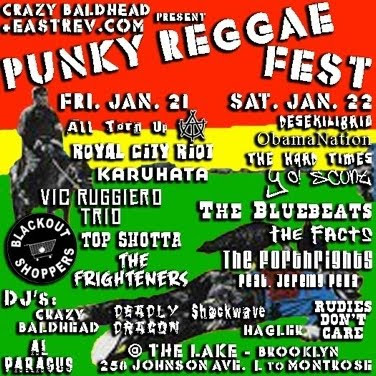 Then join me in heading over to The Lake in Bushwick, Brooklyn for Punky Reggae Fest, a 2-day festival highlighting a fantastically diverse line-up of ska and reggae bands and DJ's who are showcasing all the great ska bands and musicians who call New York City home. The first night of the festival on Friday January 21st features All Torn Up!, Royal City Riot, Karuhata, Vic Ruggiero Trio, Blackout Shoppers, Top Shotta and The Frightners. The second night on Saturday January 22nd features: Desekilibrio, Obamanation, The Hard Times, Yo! Scunt, The Bluebeats, The Facts and The Forthrights featuring Jeremy Pena. Take the L train to Montrose and walk on Bushwick Ave. until you hit Johnson Ave and make a left. Take the J/M train to Flushing Ave. Walk on Flushing until you hit Bushwick Ave. turn left. Walk on Bushwick Ave. until Johnson and make a right.